After jumping on the smushi bandwagon years ago, one of the aspects of smushi construction I found I enjoy the most is experimenting with flavor combinations. The smushi is small, so it’s easy to try a little of this and a little that with each bite. It struck me one day that leftovers provide the perfect ingredients for a little of this and that. I would have to say that building smushies with leftovers may have taken over the number one spot of what I most enjoy. As a family of five, we often have that sixth chicken breast, or that sixth salmon filet left over. I am always happy to save it, but often it is not enough to be useful. Until I discovered that one chicken breast or one salmon filet is just enough to make a beautiful plate of smushies. A smushi or two for each person with a cup of soup or a small salad is the perfect lunch. The smushi gives the leftover a new life so no one feels like they are eating the same meal again. Recently, Annette and I were testing some smushi recipes. As we were sampling (oh, I mean working), I kept thinking of that lone salmon filet sitting in my refrigerator. I thought it would taste wonderful with a new spread Annette had developed. 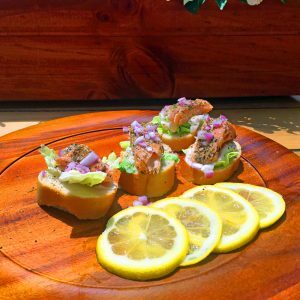 So we built some beautiful salmon smushies, adorned them with some fresh herbs and red onion, and served with lemon slices. A perfect use for a leftover that became a perfectly delicious smushi. Give it a try! There’s no way to do it wrong. Put a little bit of that leftover meat or vegetable on a small piece of bread with some lettuce, add a tasty dollop of mayo or your favorite salad dressing plus a pinch of salt and build a smushi. Make a tray of the same combination, or make each one a little different. It will look and taste delicious. And it will certainly impress!